There are many talented people out there, with lots of fantastic ideas to share. 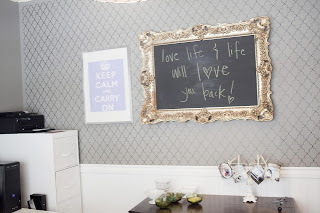 With my recent bedroom makeover, I gathered ideas from many places. I love this paint treatment. It's a stencil. I will probably add some molding to the top and bottom of my walls. I love these sweater pillows. 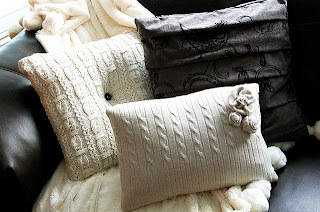 I bought a grey cable knit sweater from Goodwill (1/2price) and sewed up a pillow. Even with my less-than-stellar sewing skills, it turned out pretty well. I love this wall. I love the randomness of the white plates. 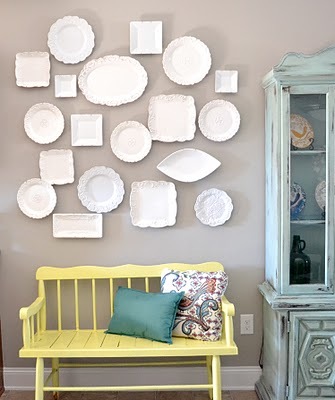 I do have plates up on my dining room wall, but I think this is going to look fantastic on the dark grey walls in my bedroom. After I finish the bedroom, I'm moving into the master bath to paint and frame out the mirror like this one. I just have a few details to finish up in my bedroom and will post photos.